A former Philippine military chief who had recently been accused of high-level corruption has died after apparently taking his own life. 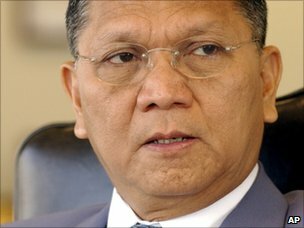 Retired general Angelo Reyes is thought to have killed himself with a single gunshot to the chest. In recent weeks, a Congressional inquiry has been hearing allegations of how Gen Reyes embezzled more than $1m (£620,000) from state funds. Allegations of corruption often blight the poorly-paid, badly-equipped army. Early on Tuesday, witnesses saw Gen Reyes arrive in a cemetery in Manila. They said he went to his mother’s grave, then sent his children back to the car, before a single shot rang out. He was pronounced dead on arrival at a nearby hospital. Gen Reyes was an influential figure; he was head of the armed forces under President Joseph Estrada, and went on to hold various government posts. But recently he has been making headline news in a different way. A former military budget officer told a Congressional hearing that several key army figures, including the general, had siphoned off enormous amounts of money for their own personal gain. Gen Reyes is accused of getting more than $1m when he left his post – the amount allegedly had to be converted from Philippine pesos into dollars because it was too bulky to carry. Corruption allegations against the uniformed forces are nothing new, although they rarely involve this amount of money. MANILA — A former defense secretary and military chief of the Philippines who was implicated in a major corruption scandal in the armed forces died Tuesday morning in an apparent suicide, officials said. The former defense secretary, Angelo Reyes, 64, sustained a single shot in the chest, Health Secretary Enrique Ona said a few minutes after doctors had pronounced Mr. Reyes dead. Police Chief Superintendent Francisco Manalo said Mr. Reyes shot himself on Tuesday while at the cemetery where his mother is buried. Mr. Manalo said foul play had been ruled out as a cause in Mr. Reyes’s death. According to one of his aides, Mr. Reyes visited his mother’s grave Tuesday morning with two of his five children. At one point, he asked to be left alone by her tomb. “Then I heard a loud gunshot,” the unidentified aide told radio station DZMM. Mr. Reyes had been accused of taking kickbacks from military contractors while he was the armed forces’ chief of staff in 2000 and 2001. Former colonel George Rabusa, who has been testifying in both houses of the Philippine Congress, has accused two other former chiefs of staff of similar crimes, disclosing what appears to be systemic corruption within the military. Mr. Reyes, who was present when Mr. Rabusa made the accusations before a Senate committee, vehemently denied any wrongdoing. Mr. Reyes served as chief of staff of the armed forces under President Joseph Estrada. In January 2001, Mr. Reyes broke away from Mr. Estrada and supported the “people power” movement to oust Mr. Estrada. Mr. Reyes described the act as “withdrawal of support,” and it contributed to Mr. Estrada’s ouster days later. Gloria Macapagal-Arroyo, who replaced Mr. Estrada, appointed Mr. Reyes defense secretary. Mr. Estrada’s son, Senator Jinggoy Estrada, encouraged Mr. Rabusa and other witnesses to provide testimony in the Senate’s investigation of military corruption. You are currently browsing the The Way blog archives for February, 2011.